These are pictures of my 'newest' invention. Does anyone have any idea what they're supposed to do? Either a torturing device or it is some kind of cooling device. xenopeek wrote: Either a torturing device or it is some kind of cooling device. You're warm...but a cooling device for what? Darn. I couldn't stump anyone. Oh well, these are supposed to be cooling fins for the Ignition Coil packs on my 1990 Chevy Corsica. I looked high and low on the internet, trying to find anything that did what I need these to do. Only not to find anything. The coil packs on my Corsica are mounted on the back of the engine, facing the firewall, with less than a foot of clearance between. This causes the coil packs to heat up fast and since they're located on the back of the engine, there isn't very much air circulation, which only makes them heat up more. This is the first stage of improving the coil packs performance. If it seems like I have to, I may try to mount a 12VDC fan aimed at the coil packs to keep them cool. That is, if I can only find a place to mount one. I was going to speculate it was a cooling system for a matter-anti-matter reactor on your shuttlecraft, but... oh well, JeremyB beat me to it. Portreve wrote: I was going to speculate it was a cooling system for a matter-anti-matter reactor on your shuttlecraft, but... oh well, JeremyB beat me to it. I might be able to use one of those too, once I get this crate to 88!!! The best I could come up with was some sort of heat sink. I guess that's right... sorta. Well, it was pretty obviously a heat sink for something. At first glance, I thought that was the head from a lawn mower engine. But then the strap across the top would block access to the spark plug, so my next guess was maybe it's the head off some kind of compressor, like an air compressor, or from a refrigeration unit. On further examination, I can see that it is made of plastic, so not the head off anything like that. Pretty sure I've never seen an ignition coil like that. It looks nothing like the coil on my '65 Bug. You might find that it would work better if, instead of holding the fins on the way you have it, you bonded them to the coil with a heat conducting epoxy, a number of which are readily available. Amii_Leigh wrote: These are pictures of my 'newest' invention. Hey, Amii, I'd love to see your concept for a neutron flow polarity reverser¹. Fortunately my garage is Blue Oval and IH. So I dont need cootie-bobbed contraptions like GM cars do! Amii_Leigh wrote: Darn. I couldn't stump anyone. The 91 Lumina's have them on the front of the engine with some air conditioning plumbing in the way to have easy access to them. My little sister had the Lumina years ago when she was in college and had issues with the engine dying and had me look at it, once I replaced the ignition control module located underneath the coil packs there we no more issues. The ignition system was referred to as "waste spark" as one coil would fire 2 spark plugs at once on cylinders on opposite ends of the four stroke cycle- one cylinder would be on the compression stroke where ignition of the fuel/air mixture would occur and the other cylinder would be on the exhaust stroke. We had a 90's pontiac grand am. It had the same issue. the 3.1L v6 motor gm made was a pile of junk. the engineers thought it was a good idea to mount the coil packs over the exhaust manifold. One day the packs overheated and killed the motor.the camshaft snapped and this forced a valve through a piston. If your a v6, your the same engine. the first gen of that motor was in the front. The second gen they moved it to the back manifold. It didnt help any.The common fix was to remove the mount for the packs and place washers or a nut stack underneath. Once put back together the coil packs will be elevated a half an inch. Allowing airflow underneath. TOYOTA -- spelled..."Put gas in from the outside and drive it from the inside." I've never had a problem with any Toyota I've bought. They just run fine. CaptainKirksChair wrote: TOYOTA -- spelled..."Put gas in from the outside and drive it from the inside." I've never had a problem with any Toyota I've bought. They just run fine. Well, Mister Chair, it wasn't my choice as to what car I'd get. I suppose in a better world, there would have been some kind of choice. But as it was, I inherited this from my grandparents, who had sort of given it to my parents after they had passed on. My parents hated the car, left it parked in a machine shed for most of the ten years they owned it and after they moved to their new place, they gave it to me. They hardly ever drove it, so they had no idea of the scope of it's problems. However, I got to ride in it once when my grandparents owned it. My granpa drove me to my parents house in it. I fell in love with it then, and I'm still in love with it now, despite all it's shortcomings. I just love the idea of keeping old things working, somehow it seems better to me that way, than just tossing them away for something new and shiney. Not that this car looks bad. Really, After a particularly bad hailstorm, my granma had it repainted really well. That part looks great. Maybe I should take a picture of it sometime. I suppose in a better world, there would have been some kind of choice. Amii_Leigh, I understand. Sometimes it's what you can afford versus what you want. Sometimes those two come together, sometimes they don't. When a half-asleep trucker driving only his cab hit me, I thought I was a goner. I made it through without a scratch but the car got totaled. What I wanted was a good car. What I could afford was a used Oldsmobile that eventually just fell apart. After that, it was a Toyota, and I found a way to afford them. 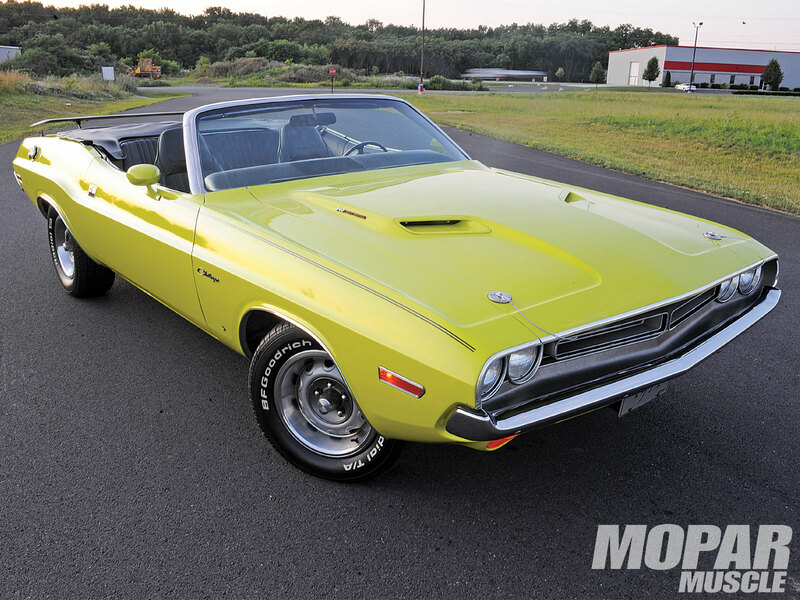 Of course, I wouldn't turn down a 1971 Challenger. CaptainKirksChair wrote: When a half-asleep trucker driving only his cab hit me, I thought I was a goner. I made it through without a scratch but the car got totaled. So, every day for you is a bonus day. Everything really did go in slow motion. Nothing I did, speed up or slow down, seemed to make a difference. He just merged from my left directly into my lane. I remember hitting the right side guard rail, over-correcting, going directly behind his vehicle, and slamming into the center divide head on. Had he had a trailer attached, it would have decapitated me. I was driving a 1990 Hynudai Excel 2 door hatchback. The car still ran fine but fixing it cost more that it was worth. So it got totaled. I still want one of these new retro mustangs. Hard top. I have a 351C on the engine stand and it needs a good home. I remember watching an episode of Graveyard Cars and they were starting a 426 Hemi for the first time after a rebuild. One of the guys said, "Every time one of these starts, a Prius dies." I think I laughed for a week.